This post will be dedicated to two Czech greats that have been attracting lots of spotlight in the past months and weeks here in Prague. 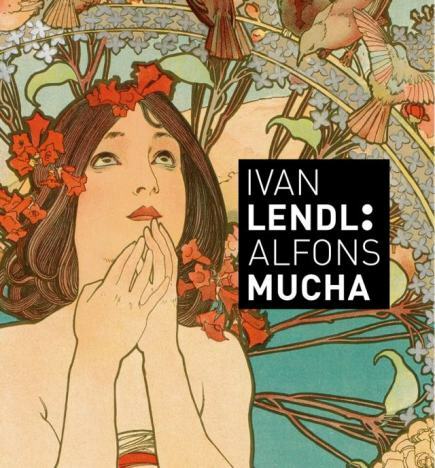 We are talking about Ivan Lendl and Alfons Mucha. Ivan Lendl was one of the best tennis players of all time. Born in 1960 in Ostrava, Czechoslovakia, he began to dominate the world of tennis at the turn of the 1970s and 1980s, helping Czechoslovakia win the 1980 Davis Cup. A great video showing his early years can be found here. After some disagreements with the Communist government (Lendl applied for the type of Czechosloval passport that would allow him to reside permanently in the USA to train all year but did not get it), he escaped to the US in 1986, becoming a US citizen six years later. We can still remember this (Jan used to play lots of tennis when he was young). Tennis in the 1980s had a huge following here in Communist Czechoslovakia, also because it allowed you to travel to the West on a regular basis. Unfortunately, Czechoslovak TV did not cover any of the major tournaments mostly because the coverage would alway include two renegades, two famous athletes that fled from Czechoslovakia to the West: Martina Navratilova and Ivan Lendl. And when a celebrity fled to the West, it would never be heard of again; therefore, no coverage of major tennis tournaments in Czechoslovakia, with only bare results shown on the back pages of the sports section in the newspaper. The lack of information on one hand and apparent stardom on the other lead to the creation of many myths: myths about Lendl's alleged lack of talent, which obviously was untrue - you can't be the World No. 1 for five years without talent - although Lendl himself did confess that he did not possess the talent of Boris Becker or John McEnroe and had to work that much harder. His "hitting hot" style ushered in the era of power tennis we see on the circuits today. Currently, he is coaching the Scot Andy Murray, World no. 3 player at the moment. In 1982, Lendl met Jiri Mucha, the journalist and writer son of the famous Czech illustrator and painter, Alfons Mucha. Inspired by this encounter, Lendl, assisted by the help of Jack Rennert, the US expert on Belle Epoque posters and the author of a book about Mucha, began to collect Mucha's posters and panels. He achieved to collect 116 out of the 119 posters on record (the two remaining ones form parts of collections held by national museums, and one apparently does not exist anymore in print), thus becoming the largest and best collector of Mucha in the world. Lendl apparently took all the passion he dedicated to tennis and put it in the effort to collect the comprehensive works of Mucha. Why are we writing about this? Because Lendl's collection will now be shown, for the first time ever, to the public in its complete form! Starting from 10 April, you can see the exhibition in the Municipal House in Prague (the most appropriate place for this, as Alfons Mucha did participate in the decoration of the Art Nuveau building). We think this is a great opportunity to see the complete poster works of one of the most famous Czech artists in the world. For more details, please see the website of the exhibition here. The entry costs CZK 180 (EUR 7, USD 9) and the exhibition will close on 31 July 2013. See you there!